I may have a dad who's a red-head, look great in green, and only measure up with a slight 5'6" stature, but my heritage can't be traced back to the Emerald Isle. 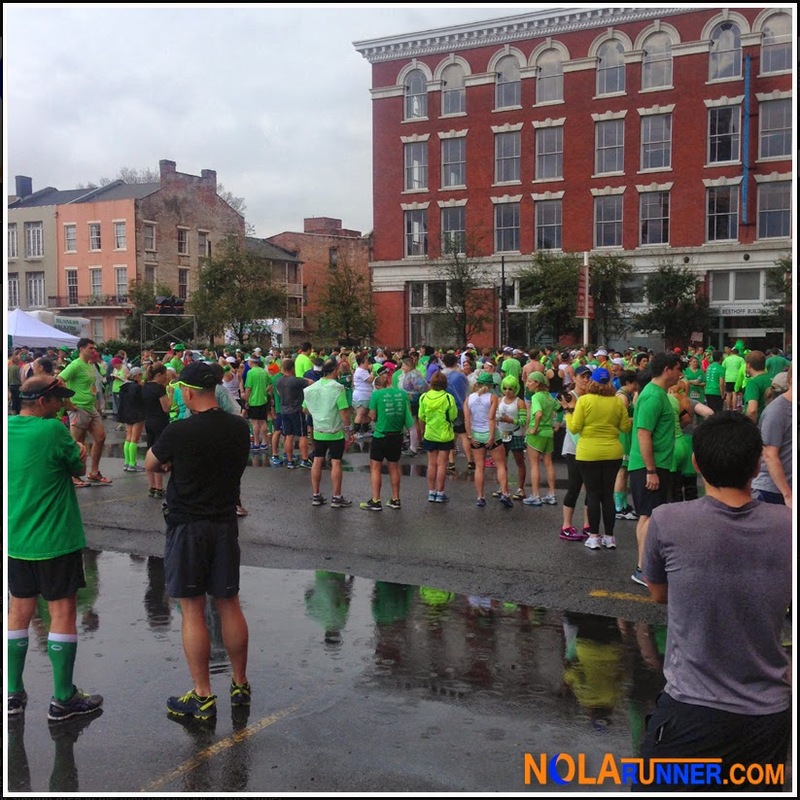 Regardless of my ancestry, at last Sunday's Shamrockin' Run 8K through uptown New Orleans, everyone was Irish. The weekend kicked off with a dismal looking weather forecast. A subsequent email from race organizers informed participants that the starting gun would fire an hour later than originally planned. Nevertheless, my friend Katherine and I synced our schedules to meet up pre-race to carpool for the run. Knowing that the weather would be a deterrent, having someone else hold me accountable ensured my participation. As predicted, race morning was a soggy mess. Fortunately, free street parking near the start is super easy to come by for this race, as the main arteries are mostly open throughout downtown. The race only blocks one intersection before exiting the Central Business District and heads toward uptown. Once parked, Katherine and I headed to the packet pickup area where we were trapped for several minutes during a torrential downpour. Once the shower slacked up, we returned to the car to stay dry until race time. For some strange reason, I was seeded as a walker for the race. The giant "W" on my bib felt like a scarlet letter, reminding me that I've been slacking on my training. However, Katherine and I decided to start somewhere between the "A" and "B" corrals (with "C" and "W" being the remaining options). The arrangement was super easy and efficient for runners to line up with participants of similar skill levels, and other races of this size should consider utilizing a similar setup where side streets separate corrals that feed in to the main artery of the course. 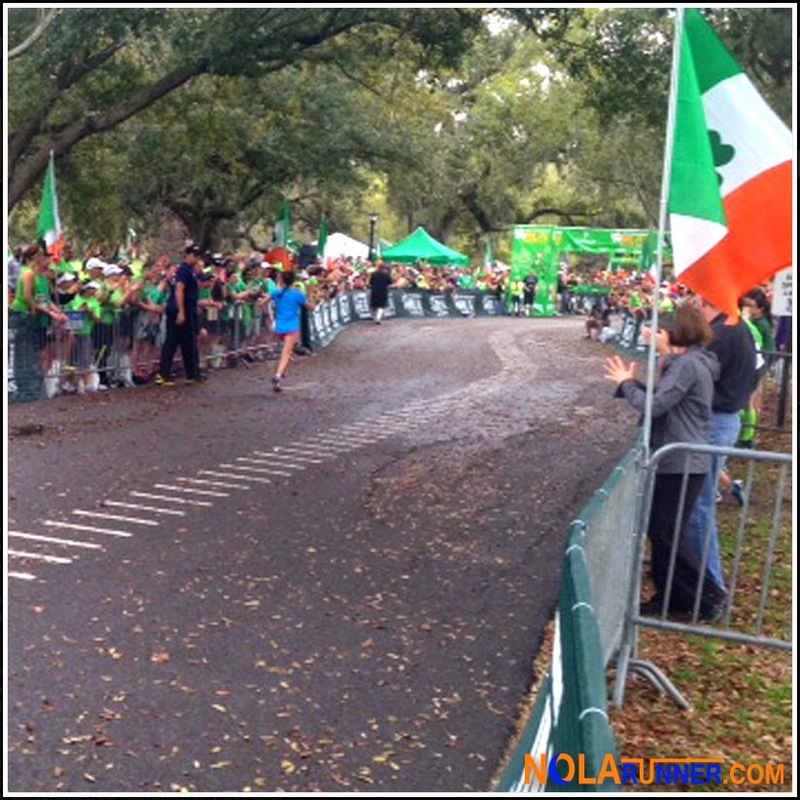 The National Anthem of Ireland was followed by the United States', and soon we were taking off up Prytania Street heading toward Audubon Park. The course is point-to-point, with a layout that's intended to be linear on one main thoroughfare. However, thanks to ever-present construction on New Orleans streets, two diversions were added this year at Napoleon Avenue and Jefferson Avenue. The extra U-Turns increased the distance on the initial stretch, and required runners to spend less time under the oak trees in Audubon Park. This is unfortunate for many runners who welcome the smooth asphalt of the park's running path after dodging potholes for four miles. Personally, I enjoyed the two diversions in the course; however, the brief showers that intermittently disrupted the race were less enjoyable. Even though the rain helped keep the temperatures down, I'm not much of a fan of being wet while running. Not only does it lead to physical discomfort, but it makes me burn through iPods at an alarming rate. Fortunately, the two stints of precipitation were brief and it was over before I crossed the finish line. The finish line of the Shamrockin' Run 8K is a spectacle, mainly because as you approach the archway, you're greeted by the smooth moves of New Orleans' own 610 Stompers. If you're unfamiliar with their gyrations, there's YouTube videos a-plenty, but they don't do these guys justice. My finish time, which I checked after witnessing some of the Stompers' moves, showed I had achieved the one thing I set out to do: keep an even pace. While my performance paled in comparison to what I saw at the finish line, I was happy with it nonetheless. Katherine and I planned on sticking around for much of the post-race festival. Of course we wanted to enjoy the plentiful jambalaya that was served up by numerous volunteers, but we also wanted to witness the post race entertainment. This year's Shamrockin' Run 8K was followed by an elite race that brought in some of the fastest distance runners from around the world. These runners completed nearly three loops of the Audubon Park track as they competed for a prize purse totaling $70,000. Many of the 8K participants stuck around to witness the elite field challenge each other, and they were treated to a display of enormous athletic ability. I was in awe of the consistent and natural movement of these gifted runners, and it was a thrill to witness firsthand. Normally while these guys are laying down 4 minute miles, I'm 20 minutes behind them running my 8:30's. Having the elite runners separate from us laymen was a great element after the race. This year, every runner received a technical fabric participant shirt AND a glass beer mug after finishing. The distribution of these items at the post race party could have used a little more organization, but that's a small problem to have when there hoards of runners finishing at the same time. In its second year, the Shamrockin' Run 8K stayed consistent by once again being a great event. Organizers maintained a very reasonable registration fee while adding great amenities for participants. 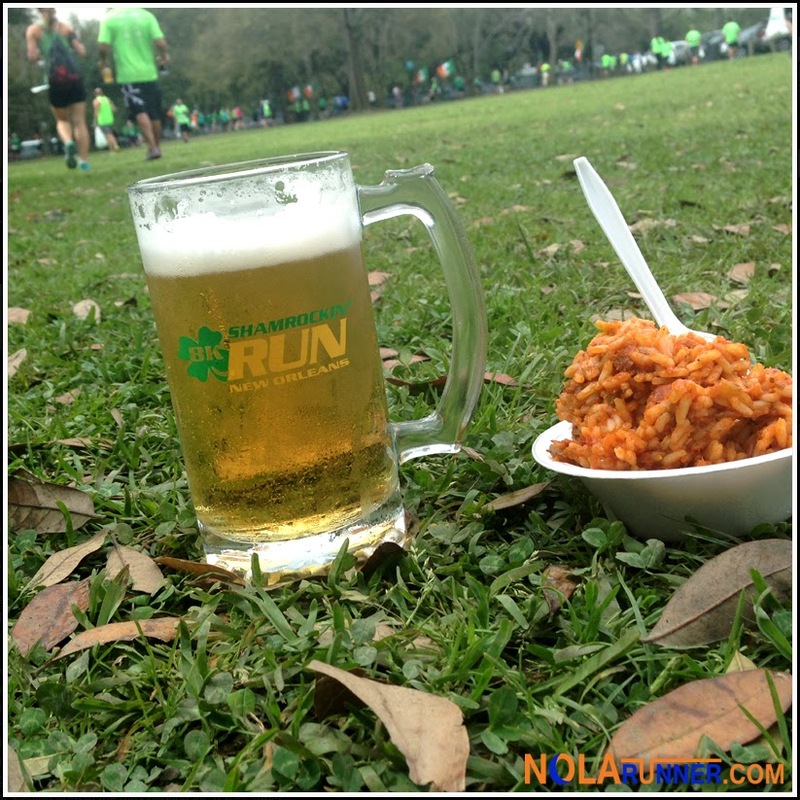 The above mentioned tech shirts and beer mugs are a couple examples of this value, but the great race execution and free flowing beer at the post race party are what's going to keep New Orleans runners looking forward to the race every March. Next year, I'm considering participation in the Guinness Challenge. This is run in conjunction with the Shamrockin' Run 8K; however, this challenge requires consumption of a 4oz Guinness Beer at each mile marker. I'm someone who can't drink Guinness while standing still, so training for that race will definitely be interesting. Thankfully, each mile marker comes with a bagpipe ensemble serenading race participants. I believe it's scientifically proven that the sound of bagpipes helps Guinness go down smoother. Complete race results can be found HERE. 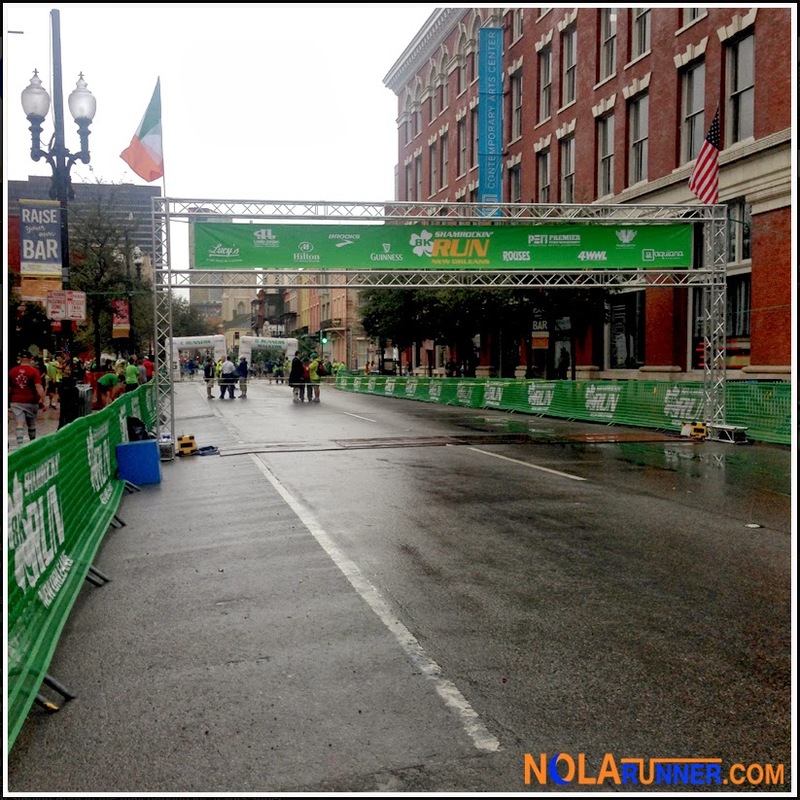 For more photos from the 2014 Shamrockin' Run 8K as well as videos from the elite race, LIKE the NOLArunner Facebook page HERE.